What if you had a pool of repeat customers and loyal, raving fans waiting to buy EVERY SINGLE ONE of your digital products? What if you never had to chase or wonder where the next sale of your digital product is going to come from? Your First 100 will allow you to discover how to take the brand and business you have right now and transform it into one that has the potential to build repeat customers and loyal, raving fans. Brand loyalty isn’t just for the big brands. Your First 100 will show you how you can tap into the exact loyalty recipe as an online business and brand selling digital products. 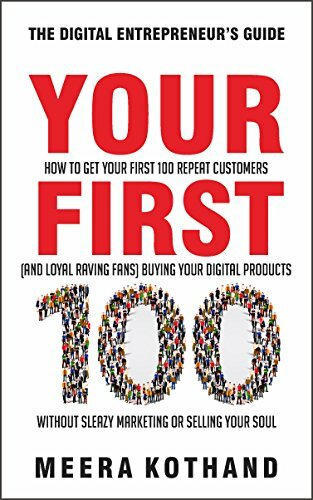 In Your First 100, you will be introduced to a system of ideas and questions to think about, ask yourself, and apply to your digital product–based business in 5 core areas so that you can turn first time visitors into repeat customers and loyal, raving fans. Your offers (paid and free) become seductive magnets of YES! that your audience can’t resist. Your audience is sold on whatever you put on sale because it’s from YOU and they want it. Every core area in your business is intentional and works toward creating a brand experience that attracts your tribe—your repeat customers and loyal, raving fans. That’s the power of the process and promise behind Your First 100.